Hours before NASA's Opportunity rover will reach Mars, engineers have found a way to communicate reliably with its twin, Spirit, and to get Spirit's computer out of a cycle of rebooting many times a day. Spirit's responses to commands sent this morning confirm a theory developed overnight that the problem is related to the rover's two "flash" memories or software controlling those memories. "The rover has been upgraded from critical to serious," said Mars Exploration Rover Project Manager Peter Theisinger at NASA's Jet Propulsion Laboratory, Pasadena, Calif. Significant work is still ahead for restoring Spirit, he predicted. Opportunity is on course for landing in the Meridiani Planum region of Mars. The center of an ellipse covering the area where the spacecraft has a 99 percent chance of landing is just 11 kilometers (7 miles) from the target point. That point was selected months ago. Mission managers chose not to use an option for making a final adjustment to the flight path. Previously, the third and fifth out of five scheduled maneuvers were skipped as unnecessary. " We managed to target Opportunity to the desired atmospheric entry point, which will bring us to the target landing site, in only three maneuvers," said JPL's Dr. Louis D'Amario, navigation team chief for the rovers. Opportunity will reach Mars at 05:05 Sunday, Universal Time (12:05 a.m. Sunday EST or 9:05 p.m. Saturday PST). From the time Opportunity hits the top of Mars’ atmosphere at about 5.4 kilometers per second (12,000 miles per hour) to the time it hits the surface 6 minutes later, then bounces, the rover will be going through the riskiest part of its mission. Based on analysis of Spirit's descent and on weather reports about the atmosphere above Meridiani Planum, mission controllers have decided to program Opportunity to open its parachute slightly earlier than Spirit did. Mars is more than 10 percent farther from Earth than it was when Spirit landed. That means radio signals from Opportunity during its descent and after rolling to a stop have a lower chance of being detected on Earth. About four hours after the landing, news from the spacecraft may arrive by relay from NASA's Mars Odyssey orbiter. However, that will depend on Opportunity finishing critical activities, such as opening the lander petals and unfolding the rover's solar panels, before Odyssey flies overhead. Spirit has 256 megabytes of flash memory, a type commonly used on gear such as digital cameras for holding data even when the power is off. Engineers confirmed this morning that Spirit's recent symptoms are related to the flash memory when they commanded the rover to boot up and utilize its random-access memory instead of flash memory. The rover then obeyed commands about communicating and going into sleep mode. Spirit communicated successfully at 120 bits per second for nearly an hour. "We have a vehicle that is stable in power and thermal, and we have a working hypothesis we have confirmed," Theisinger said. By commanding Spirit each morning into a mode that avoids using flash memory, engineers plan to get it to communicate at a higher data rate, to diagnose the root cause of the problem and develop ways to restore as much functioning as possible. The work on restoring Spirit is not expected to slow the steps in getting Opportunity ready to roll off its lander platform if Opportunity lands safely. For Spirit, those steps took 12 days. The rovers' main task is to explore their landing sites for evidence in the rocks and soil about whether the sites' past environments were ever watery and possibly suitable for sustaining life. JPL, a division of the California Institute of Technology in Pasadena, manages the Mars Exploration Rover project for NASA's Office of Space Science, Washington. 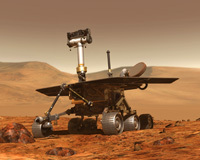 Images and additional information about the project are available from JPL at http://marsrovers.jpl.nasa.gov and from Cornell University, Ithaca, N.Y., at http://athena.cornell.edu .